We’ve received lots of comments and suggestions related to this cs-cart addon, that’s why taking into account the customer’s wishes we added a new function. The most important feature is that now every store in CS-Cart ultimate can be linked to your subscription list by default. Also in this version: When you’re registering a new user on the checkout page you can add a checkbox with a subscription to our newsletter in user’s profile. While saving data you just need to mark the checkbox and you’ll be automatically signed for the newsletter. Automatic synchronization is also available for subscription forms (available 11 themes). 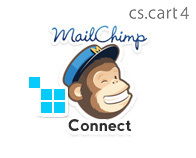 When a user subscribes to the newsletter the data is automatically sent to the MailChimp server. So now, both automatic and manual synchronizations are available. We’ve made video tutorials for the MailChimp module. This tutorials will show you how to work with the module properly, the basic setup, how you should do manual and automatic synchronization, how to add a block via the unit manager, how to change the number of fields in the subscription form and the most important that you can observe all themes on this video. This video is available for both versions of the engine- for CS-Cart 3 and for CS-Cart 4. And of course, we’ve made useful videos to ease your work with mailchimp service. These videos will show you how to get the mailchimp api key and control the subscription lists. Stay tuned for updates on our website. Follow us on twitter and Facebook and read our blog. This entry was posted in CS-Cart addons and tagged cs-cart addons, cs-cart mailchimp, cs-cart mailchimp integration. Bookmark the permalink.